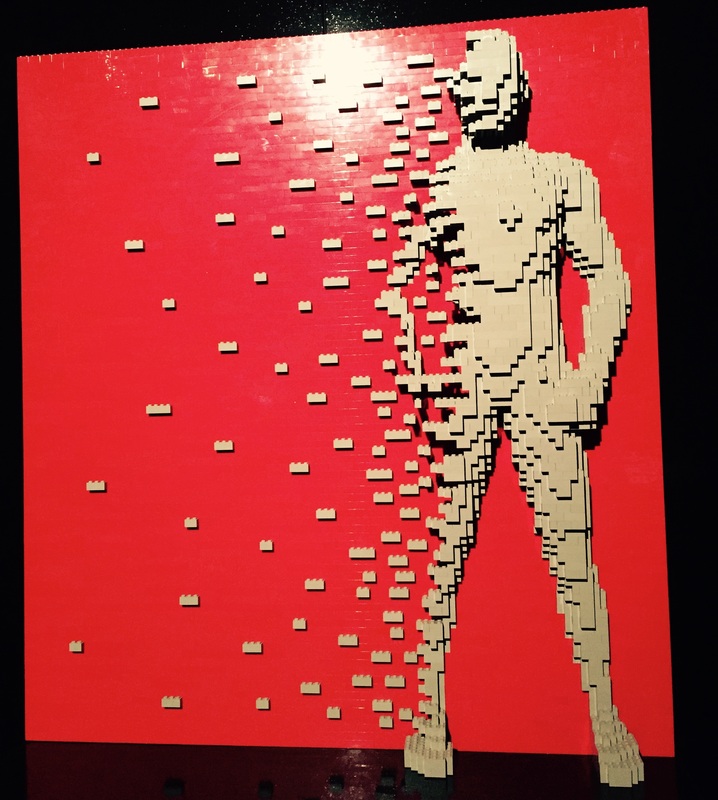 An exhibition, in the famous Brick Lane, London, of Lego bricks. 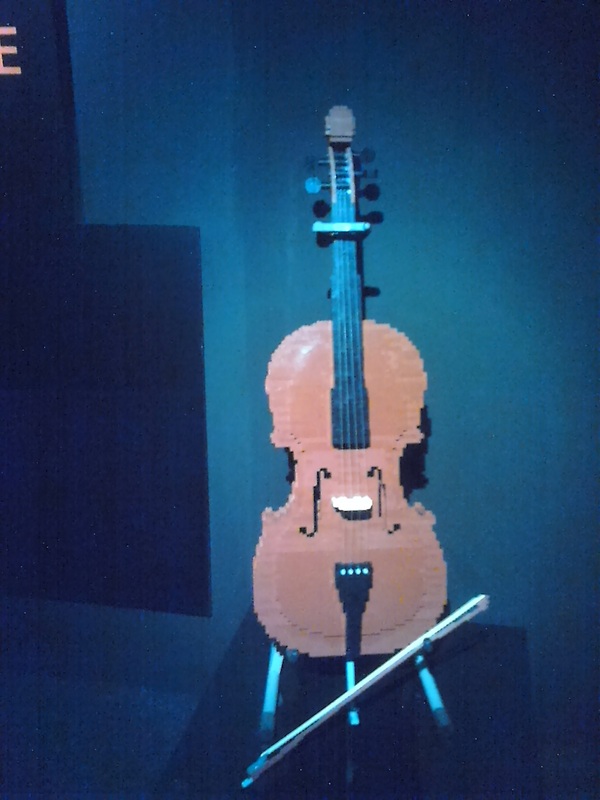 The famous Lego Bricks as constructed by the also- famous Nathan Sawaya. This is where I was led to yesterday. I know Lego, who doesn’t, I have been to Brick Lane a couple of times but had missed any adverts for this exhibition at the Old Truman Brewery so it was an unexpectedly pleasant arrival. Timed, group entry so it didn’t get too crowded as we wandered through. First was a brief introductory video by Nathan Sawaya, prefaced by where the exhibition had previesly been seen around some major world cities. Then, forward, through the darkened rooms to the highlighted, spotlit constructs. Lego-models like you have never seen! 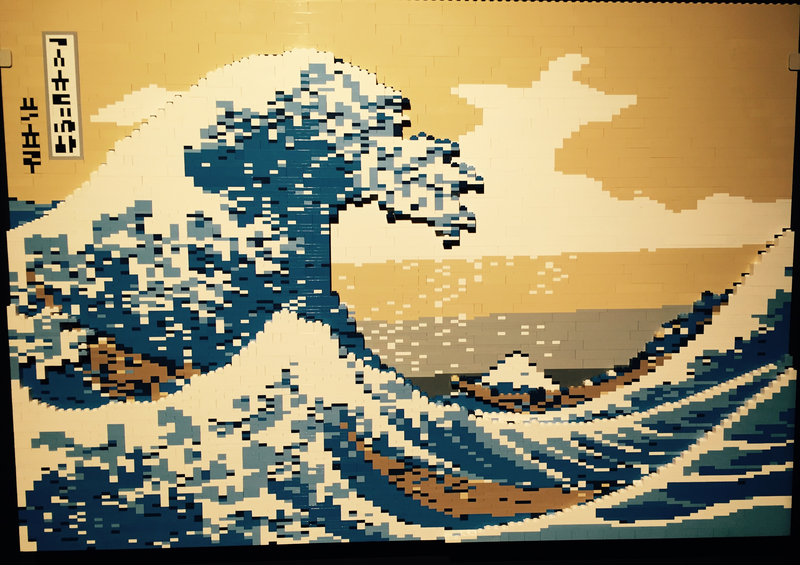 Initially we came across famous picture masterpieces reconstruced in lego. Quite intriguing how similar to the original but more pixelated, from a distance. A little more obvious as you got closer but fascinating to see the small blocks appearing in the picture. Interesting to see the difference in one picture with its flat surface versus it’s neighbour where the connecting roundels were all facing outward creating a 3D effect. Progressing through designs of a hand, people, faces, skulls of assorted sizes and numerous others. A large, 3D version of ‘the kiss’ by Klimt; one couple, from life ( with accompanying video) in full size. Extra large masks, assorted skulls. Frequently models of (parts of) people included in the image as well as recognisable designs such as Earth and the planets. A beautiful swimmer encased in the water. A magnificent dinosaur might have been considered the highlight of the event. The room where copies of the modern portraits of Dylan, Bowie and Warhol seemed to attract less attention but were highly effective in their minimal colour range. The main highlight for me was the Cello. An incredibly realistic sculpture. My photo does not do it justice at all. 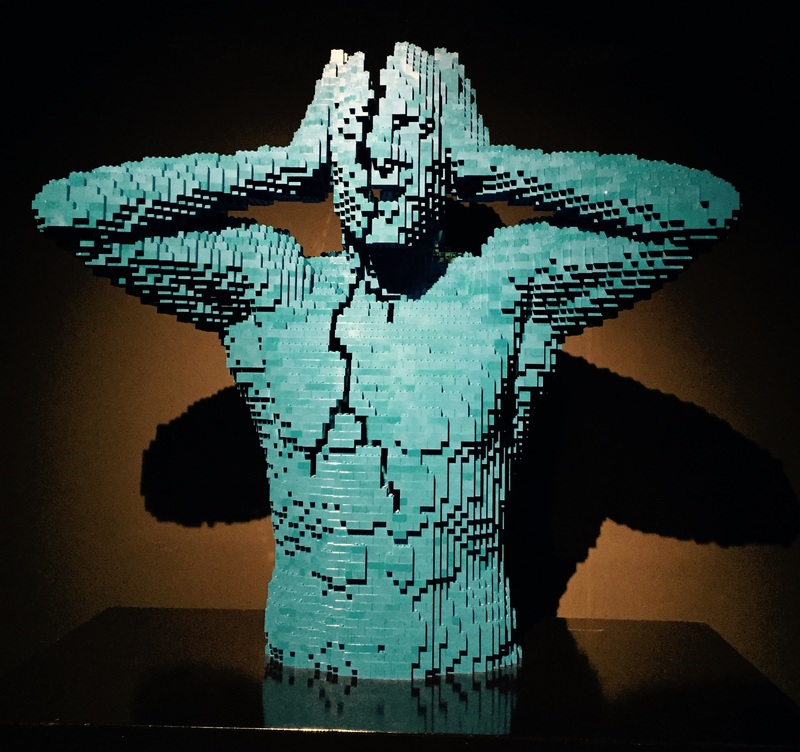 This last room is a collaboration between Nathan Sawaya and Australian photographer Dean West and a highly successful step it was. 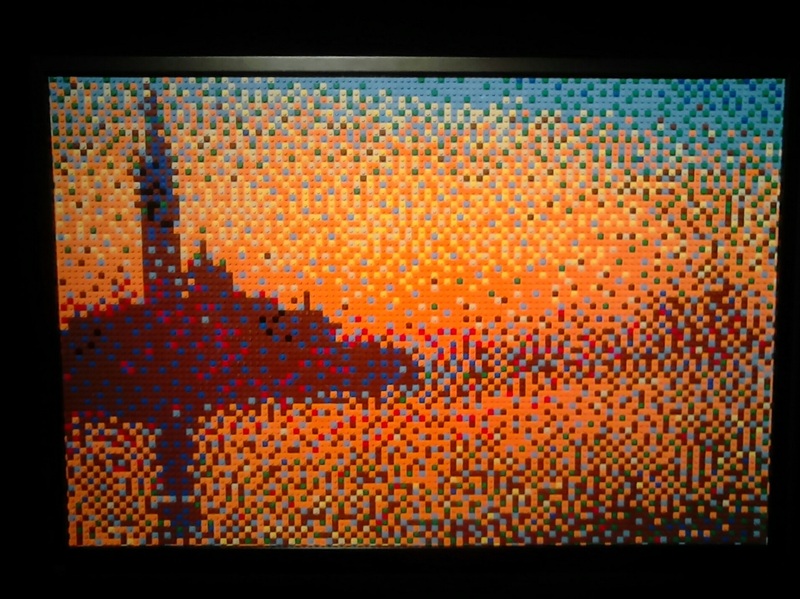 Here we initially see Lego constructs placed in front of, next to, large colour photos. I have extracted an image from the advertising website with the pictures and items included. Though on our visit the sculptures were not placed as a purely central display but near the appropriate photograph. The beauty of this room, was in the individual photos and their accompanying sculptures; the key being the way the sculpures were integrated into the pictures. I mentioned earlier that the first images were of ‘masterpieces’ that were copied, seemingly pixelated when close. In this final section we have sculptures ‘pixelated’ into photographs. A gentle discovery in viewing but unexpected and ingenious, creating additional excitement in the viewing. A selection of photographs of differing shade of image, reflecting but not quite copying iconic scenes. Finally, I have to say I was unexpectedly impressed by the exhibition as a whole and very impressed by some sculptures/pictures in particular. Also have to report that all friends, with or without children, that have visited have said nothing but good about the exhibition and the decision to have it in a gallery in Brick Lane, London. Ah yes, children: They did seem to appreciate the difficulting and quality of the ‘models’ and the very last room was laid out as a shop for lego and Tshirts etc and so on but they had a number of child-height tables smothered in assorted lego-bricks. Here children could indulge in free-modelling for as long as parents allowed (and if it wasnt too crowded). There was also a display section where they could put finished models for other to see and be encouraged by. Any proud child could place their model there, whatever it was. If the tables ran low of bricks then staff came along and topped the level up. Great for marketing, of course, but good fun to encourage creative activity. A great hour or two, well worth a visit if it should reconstruct somewhere near you.